The women’s cross country team placed second among 21 teams at Nebraska’s Woody Greeno Invitational in Lincoln, Neb. on Saturday. Defending champions of the invitational the last two years, the Coyotes ran to a 96 point second place finish, one spot behind #12 Michigan at 20 points. 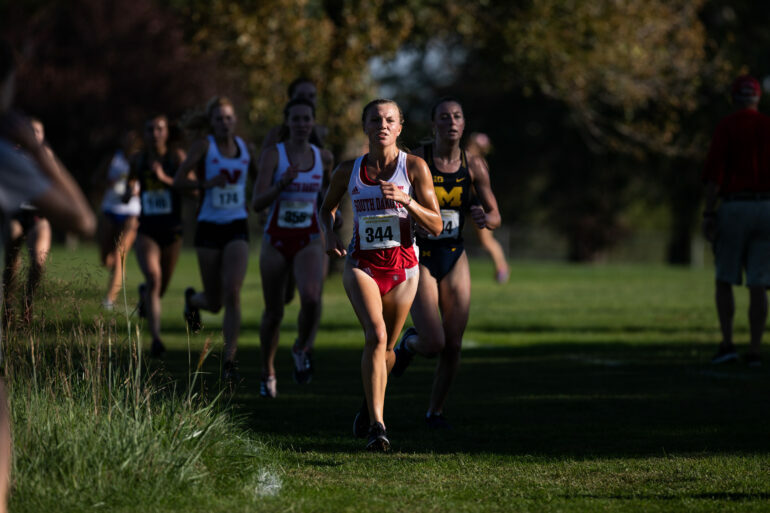 Senior Megan Billington was USD’s top finisher, taking 10th place in the 6,000 meters race with a time of 21:46. Following Billington, sophomore Laura Nelson and senior Madeline Huglen placed 20th and 22nd overall. Nelson clocked in at 22:08.6 and Huglen finished with a time of 22:11.5. To round out the Coyote finishers, sophomore Kelsi Kearney achieved a time of 22:26, taking 29th place. Behind Kearney, Kianna Stewart earned the last scoring spot for the Coyotes with a time of 22:29.1, at 31st place. Kearney said this meet is telling of the team’s performance level. “It was really cool to have everyone on our team running with the same goal against competition that we normally don’t see,” Kearney said. “Also seeing everyone finish the race despite the hot conditions. For the rest of the season, this meet helps us gauge where we are at as a team and what things we need to work on to give us an extra advantage for the meets to come,” Kearney said. USD remains ranked No. 4 in the NCAA’s midwest region behind Iowa State, Minnesota, and Oklahoma State. The South Dakota men placed 8th at the meet with a total of 239 points, while Minnesota took the meet title. In the 8,000 meter race, Senior Eldon Warner took the Coyotes top spot with a 33rd place finish at a time of 26:04.4. A fourth-year runner, Warner said his mind is always set on the finish during a race. The next Coyote behind Warner was sophomore Kallo Arno with a time of 26:27.1, taking 48th place. Following Arno were sophomores Seth Iverson and Cole Streich who placed 73rd and 76th, respectively. Iverson’s time was 27:48.9 and Streich finished with a time of 28:06.3. Iverson explained how the team’s support helps him as an individual runner during competition. Placing fifth for the Coyote men was freshman Jacob Waymire, in 80th place with a time of 28:24.0. The Coyotes will compete again at the University of Minnesota’s Roy Griak Invitational on Sept. 29.